He was to be a part of the Australian squad that will travel to India for the limited-overs tour. The Australian team on the road to the World Cup is set to take on India in a 5-match ODI series followed by a T20I series comprising two games in India starting 24th February. Having won their last ODI series against Pakistan way back in January 2017 this Australian team doesn’t really have a chance of defending their world champion tag when they travel to England. Their premier fast bowler Mitchell Starc was already ruled out of the tour because of a pectoral injury. 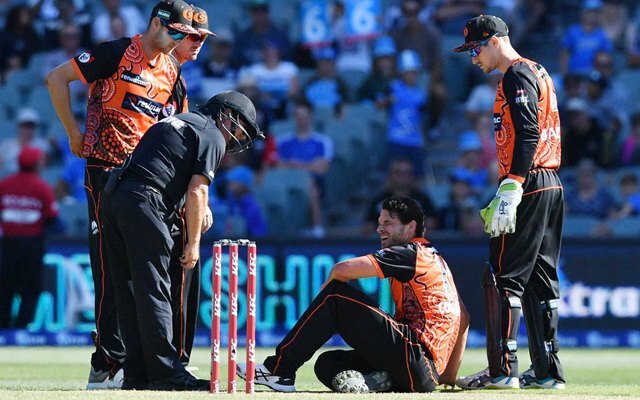 Their troubles have only aggravated as Nathan Coulter-Nile suffered a bout of vertigo during Perth Scorchers’ BBL match against Adelaide Strikers. Coulter-Nile felt discomfort after delivering the fifth ball of his fourth over against the Strikers. Though he completed the over, but rushed down in pain sooner and had to leave the field. He was taken to the hospital and had to undergo further tests for an injury which has previously intervened in his career. “They put him on an IV drip and he was feeling well enough to travel with us today, which is good,” Scorchers coach Adam Voges said after the squad arrived back in Perth. “It’s something he’s had before in the past. It’s normally taken a day or two for it to settle down. Hopefully that’s the case and there’s nothing more sinister than that. “[The doctors suggested] because he has had it in the past, he is prone to perhaps getting more episodes, but we’ll send him to some medical teams this week and see if there’s any other investigation that needs to happen,” Voges added. Coulter-Nile was supposed to be the spearhead of the Australian bowling attack for the upcoming limited-overs tour to India. For a team which hasn’t won an ODI series/tournament in last 24 months, challenging India in their own backyard looks a daunting task to say the least.